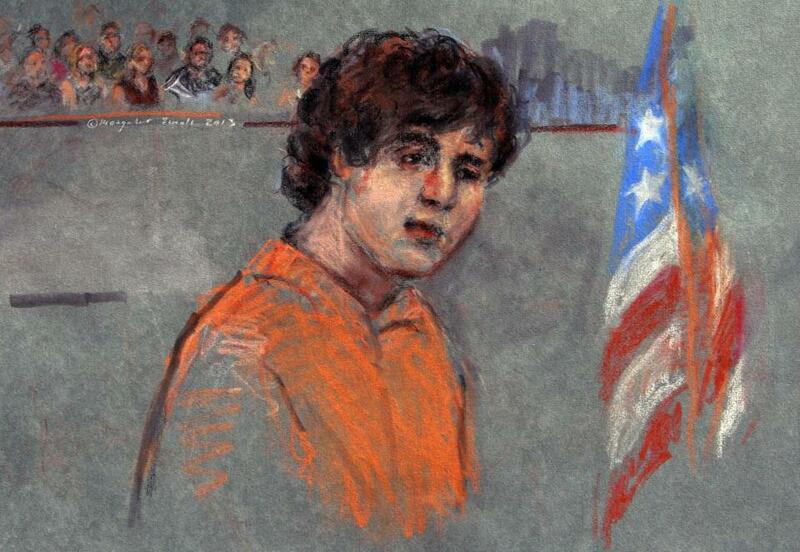 Dzhokhar Tsarnaev is shown during his arraignment in federal court in July 2013. You learn something new every day, and I just learned what mandamus means. It’s a legal term that apparently means asking for the same thing 100 different ways. Lawyers for the accused Boston Marathon bomber, Dzhokhar Tsarnaev, filed a writ of mandamus, asking the First Circuit Court of Appeals to take US District Judge George O’Toole to the legal woodshed and spank him silly. Tsarnaev’s lawyers want the trial moved out of Boston and, short of that, want to postpone the jury selection that will start on the waterfront bright and early Monday morning. They have asked O’Toole repeatedly to move the trial to Washington, D.C., where far fewer people have been exposed to publicity about the case and consequently are not as predisposed to having opinions on Tsarnaev’s guilt or innocence. At the same time, they asked O’Toole to postpone the trial for months so they can better prepare. Tsarnaev’s lawyers keep asking for the same things and O’Toole keeps giving the same answer, which is no. On Saturday, the appeals court said it would not intervene, seeing no grounds to second-guess O’Toole. All this pretrial maneuvering is to be expected, though Tsarnaev’s lawyers seem especially dogged. That, too, is no surprise. The evidence against Tsarnaev is overwhelming. When you have the evidence, pound the facts; when you don’t, pound the table. After being bored to tears by 39 pages of the defense restating its position for the umpteenth time, I must admit some sympathy, not for their client but their argument. I doubt Tsarnaev can get what legal purists call a fair trial, not just in Boston but anywhere. He forfeited that right the moment, police say, he was caught on camera putting a backpack with a pressure cooker bomb right in back of 8-year-old Martin Richard on a sidewalk on Boylston Street. His juvenile “you kill ours, we kill yours” manifesto, scrawled on the boat where he was captured four days after the bombings, didn’t help. Anyone accused of what Tsarnaev and his late, loser brother Tamerlan are accused of doing , anyone accused of a really heinous crime, can never get what defense lawyers consider a fair trial. That’s because, as loath as anybody in the legal profession is willing to admit it, the presumption of innocence is more theory than practice. Most Americans don’t presume that the guy sitting at the defendant’s table is the victim of police incompetence or some elaborate Hollywood-imagined stitch up. Life doesn’t work that way. That said, the reality, and I’ve seen it in courtrooms all over, is that jurors take their responsibilities seriously and expect prosecutors to prove their cases beyond a reasonable doubt. Juries rarely, but sometimes, also acquit. OJ isn’t the only guilty guy who’s walked. Judge O’Toole believes, and the appeals court essentially agreed, that out of the 1,200 potential jurors who will be questioned closely about potential bias a panel will emerge that can decide Tsarnaev’s fate with an open mind. Tsarnaev’s lawyers argued not just that each of the 5 millions minds in and around Boston were closed by the relentless media coverage of the bombings and suffering of the victims, but that everyone in metropolitan Boston is, in effect, a victim of the Marathon bombings. That’s patent nonsense, an insult to the three people who lost their lives, the 17 who lost their legs, the 200 others who were injured, the hundreds if not thousands who were seriously traumatized, not to mention the family and friends of Sean Collier, the MIT police officer murdered as the cops hunted the Tsarnaevs. Of course it makes no sense to impanel on the jury someone whose relative or close friend was killed or seriously injured at the Marathon. But it’s ludicrous to say someone who was watching TV in the days that followed, or whose cousin didn’t get to finish the race because of the bombing, is a victim and therefore incapable of being impartial as a juror. Similarly, the defense’s contention that everybody who lived in Cambridge, Watertown, Newton, Waltham, Belmont, Brookline, Allston, and Brighton is unfit to be a juror because of the supposed lockdown that took place on the Friday after the bombings, when police closed in on the Tsarnaev brothers, is specious. Outside a few neighborhoods in Watertown and, to a lesser degree, Cambridge where there was intense police activity, life went on pretty much as normal that day. I was, on that day, in almost all of the eight communities singled out by the defense as containing populations that were traumatized by the alleged lockdown. Outside the staging areas where there were huge numbers of police, you wouldn’t have known anything of import was going on. I spent that Friday morning in Cambridge, talking to Dzhokhar Tsarnaev’s friends. People moved about Cambridge, home to the suspects, quite freely. No one was under siege. The supposed lockdown was the equivalent of the voluntary stay-indoors orders the governor issues during bad snowstorms. Some obeyed. Many did not. In seeking a change of venue, the defense repeatedly cites the example of Oklahoma City bomber Timothy McVeigh, whose trial was moved to Colorado. As much as they cite that case, they never seem to quote McVeigh’s lawyer supporting their argument. No wonder. I talked to McVeigh’s lawyer, Stephen Jones, and he disputes any suggestion that the communitywide trauma and devastation in Boston was anywhere close to what occurred in Oklahoma City in 1995 when McVeigh blew up the federal building, killing 168 people, including 19 children. Nonsense, Jones says. Beyond the 168 dead in Oklahoma City, more than 500 were injured. More than 300 buildings were damaged or destroyed. More than 100 cars were destroyed. There was more than $800 million in damage. Jones wasn’t surprised that 58 percent of Bostonians think Dzhokhar Tsarnaev is “definitely guilty.” He’s surprised the figure isn’t higher. Jury selection begins Monday. The legal jockeying will never end.